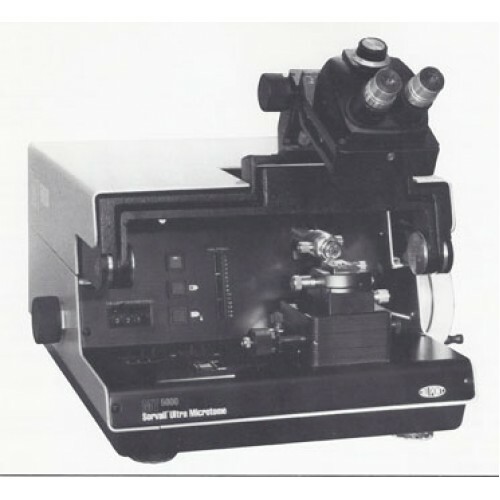 The SORVALL MT/5000, the was the world’s first micro processor controlled Ultra Microtome, is a breakthrough in Ultra Microtome design. The MT-5000 provides unparalleled accuracy and reproducibility along with a high level of operating control and ease. The results are increased productivity and superior sections. The MT/5000 builds on the high standards of precision, reliability, and operating convenience long established by its predecessors — the MT-I, MT-2 and MT-2B. The microprocessor, which is the heart of the control system, improves the accuracy and reproducibility of the time-tested SORVALL ® mechanical advance system. Other improvements include a new fiber optics approach lighting system, a diffuse lighting and viewing system, a highly effective built-in vibration dampening system, precise digital speed and thickness controls, and the unique Visutrac system. All combine to make the MT-5000 an excellent microtome for electron or light microscopy. Microprocessor control provides highly accurate and reproducible specimen advance. Visutrac optimizes productivity through quick and precise programming of the cutting zone. Jog function increases the speed and precision in approaching the knife. Fiber-optics approach lighting system provides an accurate means for visually determining the distance between the specimen and knife edge. Built-in vibration dampening system substantially reduces the need for a special table. Digital speed and thickness controls simplify operation and make settings reproducible. The MT-5000 microprocessor, coupled to a highly precise stepping motor, controls the specimen advance system. Combined with a specially designed cuffing arm mechanism, this advance system provides accuracy and reproducibility not attainable with earlier ultra microtomes. The result is more uniform and consistent sections. In addition to producing superior sections, they have been designed for maximum control with minimum effort. All controls are conveniently located on the instrument panel. Their number and complexity have been minimized to simplify operation. Section thickness and cutting speeds are set by digital switches and are therefore, completely reproducible. Visutrac — a system for tracking and controlling cutting arm movement — maximizes productivity through selection of the shortest possible cuffing zone. Finally, micrometer controls for stage knife movements, and collet rotation greatly ease operation. An extremely versatile incident lighting and viewing system, developed specifically for the MT/5000, provide maximum flexibility for illuminating and viewing sections. Also a unique fiber optics approach lighting system allows accurate visual alignment and rapid approach of the specimen to within 200 nm of the knife edge and minimizes chances of damaging the knife or specimen. The fiber optics light source can also be used as a spot illuminator to examine the knife edge or block face. This combination of new incident lighting, approach lighting, and spot illuminator make the MT/5000’s lighting and viewing system more versatile than that offered on any other ultra microtome. These Microtomes have the flexibility to meet the most discriminating microtomist’s requirements. Cutting speeds from 0.1 up to 39.9 mm/sec, accommodate almost any sectioning or trimming need. A universal knife stage assembly accepts both glass and diamond knives and the fiber optics approach lighting system is used with either. The time-tested SORVALL driven cuffing stroke, incorporated into the MT/5000, avoids problems associated with gravity powered cutting strokes and provides greater latitude for sectioning difficult blocks and non-biological material. A special specimen holder is available which allows both horizontal and vertical specimen movements.